The Nokia 8 and Nokia 3 promo pairs the smartphones with JBL accessories this season of hearts. 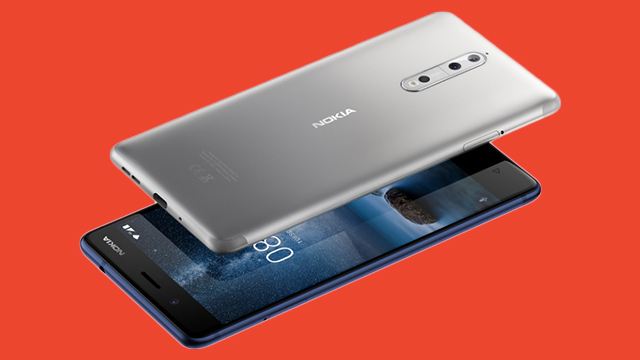 Nokia 8 gets discounted price. 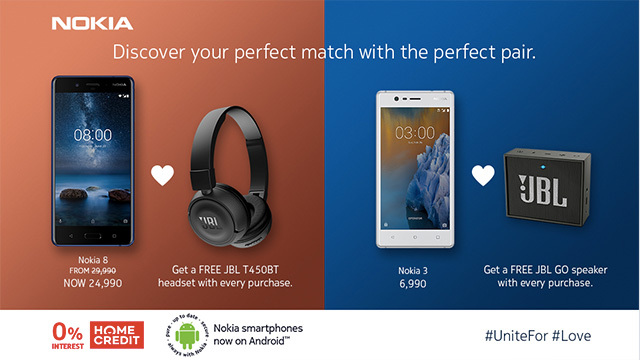 From February 1 to March 31, 2018, every purchase of a Nokia 8 and a Nokia 3 will come with free JBL accessories. With the Nokia 8, lucky buyers will get a free JBL T450BT Wireless On-ear Headphones worth Php3,000, while the Nokia 3 will come with a JBL GO Bluetooth Speaker worth Php1,599. The Nokia 8 features a 5.3-inch quad HD IPS display. It is powered by an octa-core Qualcomm Snapdragon 835 processor, paired with 4GB of RAM and 64 GB of storage. The handset boasts of a dual Zeiss 13MP + 13MP rear camera, and a 13MP front camera. It runs on stock Android. From February 15 to 28, 2018, the Nokia 8 has a discounted price of Php24,990. The phone is originally priced at Php29,990. You can also get it at 0% interest for 12 months via Home Credit. The Nokia 3 features a 5-inch display with Corning Gorilla Glass, and a polycarbonate body combined with a solid aluminum frame. It is powered by 1.3 GHz quad-core MediaTek 6737 processor coupled with 2GB of RAM and 16GB of storage. As for the cameras, the phone packs 8MP front and back sensors, both with f2.0 apertures, autofocus, and 1.12um pixel sizes. The Nokia 3 is now available with a suggested retail price of Php6,990. It also available at 0% interest for 6 months via Home Credit.